Al Shabaab and ISIS-Daesh: Why Did an American Sacrifice His Life for AFRICOM in Somalia? 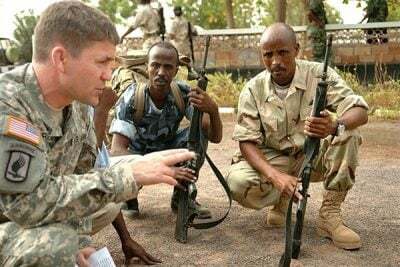 Al Shabaab’s killing of an American soldier in southern Somalia brings AFRICOM back into the limelight and restarts the conversation about why US troops are even still there in the first place. The news came in on Friday that Al Shabaab terrorists had killed an American soldier in southern Somalia and injured four others during an attack against US troops and some of their African allies near the port city of Kismayo. This isn’t the first time that something like this has happened, and its sporadic occurrence over the years has restarted the conversation about why US troops are still in the Horn of Africa country to begin with despite the highly publicized Mogadishu debacle in 1993 that permanently scarred the American psyche. The official reason is that they’re there at the request of the host government in order to assist in its anti-terrorist operations, but the real explanation has more to do with strengthening the US’ continental-wide network of informal bases and special forces rapid deployment troops that operate under the shadowy aegis of AFRICOM. Short for Africa Command, AFRICOM is “Pentagon-speak” for the US military’s operations all across that landmass, and thousands of American troops are already active in dozens of countries and several combat missions at any given time despite there only officially being one US base on the continent in Djibouti. Along with the Sahel region and especially the portion near the Malian–Nigerien border, the Horn of Africa and specifically Somalia occupy the center of the Pentagon’s focus because of the prevalence of terrorist groups there, though the situation in the latter shouldn’t be completely compared to the former. Daesh openly operates in West Africa, whereas it has yet to officially enter into the Somalian battlespace even though its reported Al Shabaab partner is equally as extreme as they are. The crucial difference, however, is that Al Shabaab has no desire for plotting extra-regional attacks in Europe, for example, but it does endeavor to carve out what could be described as a regional caliphate comprised of the ethnic Somalis living in the borderland regions of Djibouti, Ethiopia, and Kenya, capitalizing as it has on the ethno-nationalism that has an historical tendency of galvanizing the masses. That being said, the group’s mixture of militantly imposed fundamentalist Islam has lost it the appeal that its purely secular nationalist forerunners enjoyed, though that doesn’t make Al Shabaab any less of a regional threat than Daesh. Although they don’t have any global ambitions, Al Shabaab could in theory catalyze an extra-regional crisis if it were to be successful enough in its Horn of Africa campaign that it sparked a large-scale migrant exodus to Europe. That scenario, however, isn’t too likely to ever happen because it would probably be nipped in the bud well before it ever got to that point, as was seen most clearly in 2006 when the US encouraged Ethiopia to invade Somalia in order to dislodge the Islamic Courts Union from which Al Shabaab later emerged in the aftermath. The US’ “Lead From Behind” proxy management of the region and elsewhere in the world would initially make one wonder why it feels compelled to do the “heavy lifting” directly by putting its own soldiers’ lives on the line if it could just “contract” this task out to others, but that impression overlooks the geostrategic changes that have taken place in the time since, specifically Ethiopia’s de-facto alliance with China in becoming its most important African partner. Although Addis Ababa will undoubtedly behave proactively to protect its security interests in the future, it’s no longer the regional proxy for the US as it once was, which has changed the entire strategic equation for America. Instead of depending on the Horn of Africa giant, the US has realized that it’s better to engage in “surgical” drone and special forces interventions from time to time as well as cooperate with the rising Arab hegemon of the UAE, which has rapidly established several bases in the region and most notably in the de-facto independent northwestern region of Somaliland. Although Abu Dhabi and Mogadishu don’t’ get along right now precisely because of the aforementioned development, that actually works to America’s advantage because it keeps Somalia weak and therefore dependent on AFRICOM support, which has become all the more important in the context of the African Union’s phased military downscaling in the country. Keeping Somalia reliant on US military support is actually advantageous for America because it allows the Pentagon to indefinitely remain in the country and keep an eye on its Turkish partners who have just recently opened up a base outside the capital. Furthermore, the regional ideology of Somali Nationalism is still alive, albeit publicly dormant at the moment and somewhat discredited because of Al Shabaab’s exploitation of it, though it could always be repackaged and rearticulated at a later date by new US proxies if it ever desires to weaponize this for geostrategic purposes in destabilizing the increasingly Chinese-friendly governments of neighboring Ethiopia and Kenya. The “lazy” approach would be to guide Al Shabaab in those two directions just like it did with Daesh against Syria and Iraq, but a more credible and potentially effective approach can’t be discounted in the future. It should be reminded that this isn’t just groundless speculation about American strategy either but the application of the Central African Republic (CAR) model onto the region. To explain, the “NGO”-driven viral video campaign of “Kony 2012” six years ago created the pretext for AFICOM to hunt down the warlord in the quadri-national space between his native Uganda, South Sudan, the Democratic Republic of the Congo (DRC), and the CAR, and interestingly enough, by the end of that year Muslim “rebels” were on the warpath rampaging across the last-mentioned country on the way to topple President Bozizie who had just recently signed mining agreements with China. In all likelihood, AFRICOM forces used the cover of “catching Kony” to train these same “rebel” in the eastern CAR just like they could possibly do one day with Somalian ones in Ethiopia and Kenya from bases in their eponymous country. AFRICOM’s flexible use of anti-Silk Road Hybrid War instruments all throughout the continent is why the US has surreptitiously deployed its forces in Somalia and many other countries on the landmass, with these soldiers never actually being used so much for strengthening their host governments as they are for keeping them in a weak and dependent relationship on their American overlords. “Anti-terrorist cooperation” is the cover for this vassal-lord relationship, the narrative of which is exploited through decontextualized “victories” from time to time and an over-exaggeration of any given threat’s relevance to the US’ direct national security interests, as is the case in both instances with Somalia. The American who just sacrificed his life for AFRICOM in Somalia didn’t do it save his homeland from an “imminent terrorist plot” or even to prevent a terrorist victory sometime far off in the future that could set off another Migrant Crisis in Europe, but to give his country better Unconventional Warfare leverage against China in the New Cold War.